Find the perfect teacher or instructor in Arbor Heights for private saxophone lessons in your home or in their studio. Check out some of our most popular teachers near Arbor Heights including Bellevue, Tacoma, Snohomish, Kirkland and Kent. As a private instructor, I genuinely encourage efficient practice, solid technique and good tone quality, as well as an appreciation for music. I also incorporate the study of music theory and the study of music fundamentals in my lessons. I have experience teaching the genres of classical, jazz, modern, folk, and pop music and hope to extend the joy of learning music to my students as well as help them grow and gain confidence in order to bring on-going fulfillment to their musical experience. I currently teach private lessons in saxophone, flute, and piano and have experience working with individuals as well as small groups. In 2007, I received a Bachelor’s degree in Music Performance from the University of Washington where I studied jazz and classical saxophone. For the past 15 years, I have been performing with many professional groups, ranging in styles from big band jazz, classical, samba, funk, to gospel and blues. have been able to help my students grow and gain confidence, which brings on-going fulfillment to their musical experience. Gwen was a wonderful instructor. She was so knowledgable about both music theory and saxophone skills. I would totally recommend her. Very friendly and extremely helpful I’m really looking forward to my next lesson. I love how she jumped right in and got me playing. It was an honor and a pleasure working with Gwen. Due to personal circumstances, I had to stop working with her, but I highly recommend her as an instructor. She's very knowledgeable, accommodating, and made me feel comfortable. You'll find yourself in good hands with her. I am an experienced music teacher of 15 years, specializing in beginner, intermediate, and advanced saxophone players. My other specialty is working with intermediate and advanced jazz improv students of all instruments. All ages are welcome. I will customize the lessons and program to the needs and goals of each student. 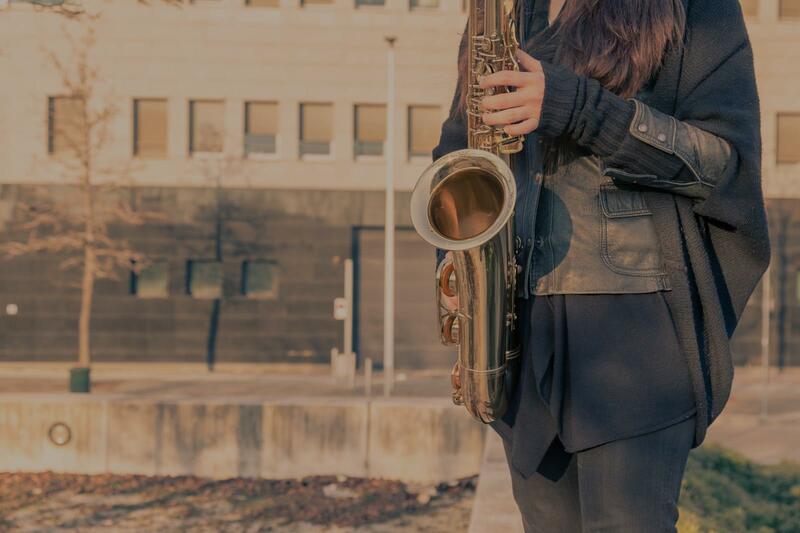 Whether you are an award winning jazz soloist or someone just starting out on the sax, I can take you to the next step and we can have a great time doing it! Let's get started! Instrumental Music Education major looking to teach beginner-intermediate saxophone players! All ages and genres welcome! (Jazz, classical, etc) Each individual student will have their own lesson plan catered to their individual needs. I also can provide beginner books and repertoire. Students will learn technique, sight reading skills, basic music theory, and more! I am an accepted student at UW-Whitewater majoring in Music Education with saxophone as my primary instrument. I am a 2x WSMA State Solo/Ensemble qualifier, earning a perfect score each time. I also directed my high school's pep band, was drum major of my school's marching band, lettered in marching band, and completed the AP Music Theory course. I can teach multiple styles, regularly jazz and classical. Students will not only learn the technical side of playing their saxophone, but also how to confidently play expressively and be a performer. "Great instructor. Knows how to work well with students of all levels." Seattle, WA teacher: Eric P.
"Eric is a great and knowledgeable instruc"
"Cool dude, excited to learn more from him." "Tia is friendly, and extremely helpful as well as knowledgeable. We love that she can come to our house. re also helpful and courteous." Seattle, WA teacher: Tia N.
le of teaching students the technical aspects of music, but his lessons incorporate a wider perspective as well, such as, listening to different genres of music and asking his students to discuss what they hear. He is always positive and encourages students to do their best. He has style and class and it is a privilege that two of my children can study under his tutelage." Seattle, WA teacher: Kareem K.
nd methodological approach with enough time and effort can turn any novice into a skilled player. He is also extremely encouraging and flexible. I've studied with Eric for five years and don't plan on stopping any time soon." approach at keeping it simple and focusing on my learning needs I have and would recommend Kareem to anyone interested in private lessons." "Gwen was a wonderful instructor. She was so knowledgable about both music theory and saxophone skills. I would totally recommend her." Seattle, WA teacher: Gwendolyn B.